omid (mashhad, Iran) on 22 June 2015 in People & Portrait and Portfolio. Lovely girl, nice portrait, excellent B/W. Lovely portrait ! beautiful mono, DOF, expression ! Excellent portrait et noir et blanc . Excellent portrait, and black and white. Precioso retrato, de la niña con el cachorro. Una imagen muy bonita y dulce... Genial b&n. Lovely portrait! Superb B/W and DOF! OOoh! comme c'est touchant de voir ce portrait de petite fille! très beau cliché en noir et blanc ! As cute each other !! So lovely ! And a wonderful B&W ! A very natural and tender moment - superb in B&W. The sweetness is everywhere, in the looks on both sides of the objective, in the gestures, in this intimacy of the centring, in the delicate light, in the tones of the photo! Very beautiful portraits! nice hear warming shot ! Sweet friends. 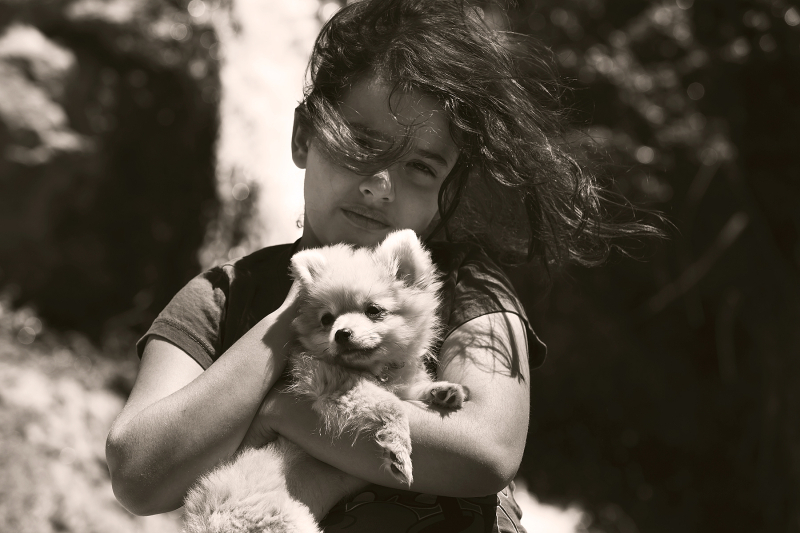 Dogs make such good companions for a child . . . or an adult. I like the way the white puppy stands out among the other elements of the picture. It is also an excellent "mood" picture of the two. This is a precious and beautiful portrait! So adorable... both the girl & puppy... a great team! :) Nice in b/w also.... I like the mood, it pulls at my heartstrings!! Delightful! Lovely expression on here face! Great portrait! So sweet and nice ! Looks like someone found a new friend!! A great capture of these two together! Beautiful portrait and excellent monochrome ... light and tones are wonderful !!! Cute! Superb image of dog and child!! This is just so touching. A beautiful portrait. So much emotion is in her eyes. Great portrait, magnificent image !!! Double cute! Well exposed and beautiful toning!